Workers’ Compensation Insurance covers chiropractic care with good reason. Some 13 separate studies in various states have repeatedly found that chiropractic care gets people back to work much sooner and at far lower cost than medical care for the same type of on-the-job back injuries. For the insurance company, not only are the direct costs lower (for seeing a Spokane chiropractor, prescriptions, and hospital costs) but the compensation costs for lost work time are dramatically lower as well. Chiropractic care usually leads to fewer chronic work related injury cases, and gets people back on their feet and back to work sooner. That is great for the patient and reason enough to choose chiropractic care for work-related job injuries. Our office is ready to help you with all of the paperwork, including filing an accident report with your employer and billing the insurance carrier. We’ll help guide you through the red tape, so that you can focus on getting better. If you have work related injuries in Spokane, call Dr. Whalen today. Over time, the human body has adapted very well to the task of hunting for and gathering food. It performs and feels its best when it is in motion during the day, and resting at night. Sitting all day, on the other hand, puts an enormous strain on the spine and its supporting tendons, ligaments, muscles, and fascia. If you are sitting at a desk and/or computer for more than 1 hour on a regular basis, then you are what we call an “industrial athlete”. 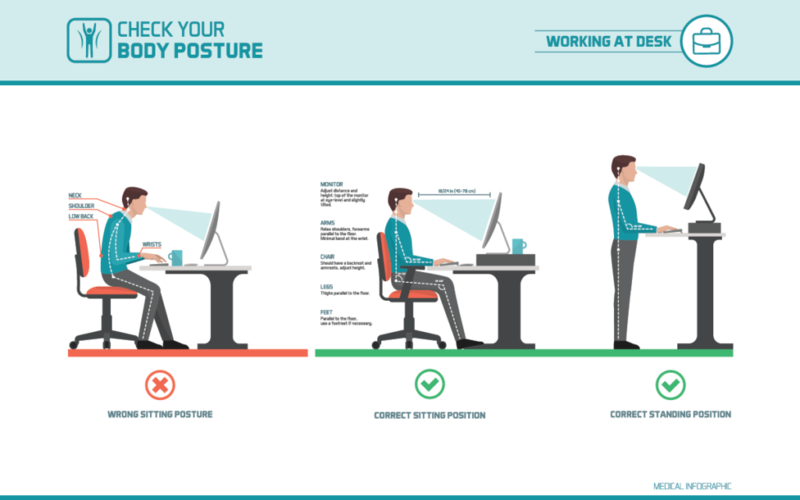 For you, proper ergonomics and micro-breaks (discussed in a separate blog) are essential to prevent neck pain, back pain, and headaches, as well as to allow your body to get the best results from your chiropractic care. Proper ergonomics involves having your computer monitor positioned directly in front of you (not off to one side), at eye-level. Your feet should be in full contact with the floor, with your hips and knees bent at approximately a 90 degree angle. It is crucial that your elbows are in at your sides at all times (even when using your keyboard and mouse), no more than 2-3 inches away from your sides or reaching in front of your shoulders. Ideally, your elbows and wrists are resting on an arm rest/wrist rest, either attached to your chair, or your desk. In order for the above requirements to be met, a drop-down keyboard tray and fully adjustable ergonomic chair are usually necessary. Dr Whalen is highly skilled in advising you how to modify your worksite to be ergonomically correct for you. They may also recommend that you request an ergonomic consultation to be performed for you by your employer. Many people don’t realize that most companies are required by law to comply with your request.